Hosting a VBS shoulnd’t break the budget for small churches! That’s why we created these 7 free vacation Bible school curriculum. This material is all free download and includes lessons, activities, directors manual, craft ideas, and more. This was our first free VBS curriculum and is based on the Armor of God (Ephesians 6). Use the links below to download each part. Created by Tara Tegard. Scroll down this page to see more ideas for using this material. Based on the Fruit of the Spirit (Galatians 5). BigHeart Farms Curriculum PDF (print friendly) or editable doc file. Activity Templates PDF (print friendly) Get more ideas on the Big Heart Farms VBS resource page. This is an Olympic theme based on 1 Corinthians 9:24-25. Click here to download the 36-page VBS curriculum manual. Get more ideas on our Running the Prize VBS resource page. Another option kids will love, it’s also based on the Armor of God (Ephesians 6). This is a Western themed curriculum written by Kristen Schmidt. Click here to download the 48-page director’s manual. Get more information and ideas on the Outlaws for God VBS resource page. 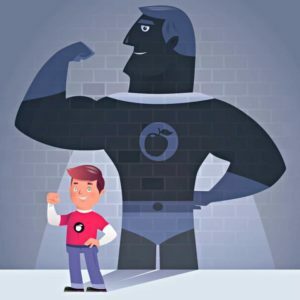 This hero themed curriculum teaches the Fruit of the Spirit (Galatians 5). 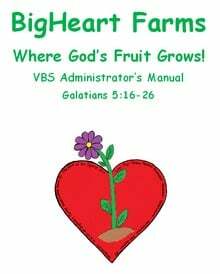 Download as PDF document (ready to print) or visit the Super Fruit VBS page to get more ideas. This one is designed to use around Easter time but could be a great summer option as well. There is nothing more Gospel-centered than teaching about the days leading up to the cross. 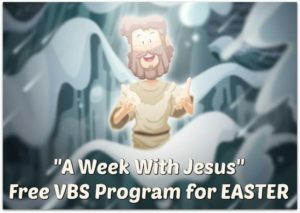 Visit the Week with Jesus VBS index page to find all the materials. We’re still working on an easy download version. Bible Boot Camp “The Armor of God” is a VBS theme based on Ephesians 6:11-18. The links below contain all the lesson plans, craft ideas, and directions you need. For more help be sure to check out our tips for planning VBS, gathering VBS crafts, or some game ideas for VBS. After you download the curriculum you will see a notice about not making copies without written permission. The curriculum creator has granted permission for you to use this in your local church ministry. So, copies in that context are allowed. For other uses, you can leave a comment on this post for the author. One of our readers, Tara Merrill, wanted to share this vacation bible school material. I was really impressed when she sent me the files. I could tell right away that put her heart into writing this curriculum. Here is how she described it in a comment on our site. Be sure to leave a message at the bottom of this page to let her know you appreciate her efforts. I am 22 years old trying to follow God’s call in my life. I believe He is leading me to write low-cost, Scripture-driven VBS programs. 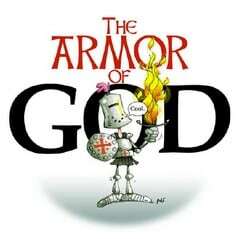 By His grace and will, I wrote one this summer centering on the armor of God passage found in Ephesians 6:11-18. It is a full program and can be adapted for any church size, as long as people are willing to volunteer. I provide craft and snack ideas, but do not include the actual materials as I believe it is cheaper to purchase the necessary items in one’s own hometown. I also provide drama scripts and dialog to help guide the leaders. Please leave your comment below with any ideas for improvements or clarifications that need to be made. Your feedback will help Tara make improvements in future programs. 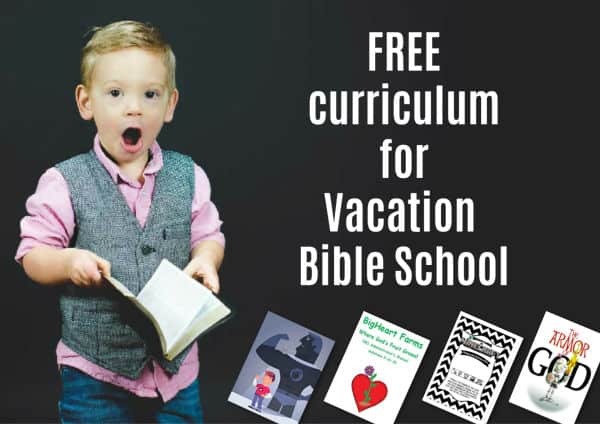 Thank you so much for offering this curriculum free, I wanted to to an “old school” VBS this year but just have not had time to do it the way I would really like to. I now only have 3 weeks before our VBS and I’m scrambling to find something. Thank you so much for having these available. Our church just finished using this curriculum. The kids had a wonderful time and the adults learned some new things, too. Thank you so much! I’m so thankful that people like you literally share the gifts God has given them. You are an encouragement to me. Thank you! Thank you so much for your generosity! I belong to a small church and I recently was put in charge of Junior Church. We haven’t had VBS for a long time. Your materials will come in so handy. Tara, thank you for this program, I have been looking for something for camp in September and I now believe that I have found the program for it. thank you for sharing your gift from God for writing programs and giving it to us fee of charge. May God Bless you as you continue to do his work. I thank God for people like you that remembers Salavation is Free. So why should we put a price on informing others about God. I pray God will continue to bless you. i’m so overwhelmed with people like you working in the vineyard. I am so humbled by your generosity. Thank you Tara, your work is not in vain! We (Full Gospel Harbor Church) just finished our first VBS, and thanks to you and THE ARMOR OF GOD it was a great success. Our church is not large, but we gained soldiers daily and not one fell out. The children loved the skits (along with the adults) and would look forward to the next performance. We want to thank you for allowing to use the material. It was full of great ideals that we would have never been able to do on our own. Keep up the good work, truly God is behind you in your quest. Thank you so much for putting up this free curriculum. I’m so thankful that the Lord brought me to this website. Not only did the children enjoy this subject with all the activities,but the Adults did as well! I pray that the Lord continues to use you! Such a blessing! Thanks Again! Thank you so much, Tara, for these wonderful lessons on the “Armour of God”. What a blessing they are and I appreciated you giving the advice for us as leaders to prepare ourselves to teach each lesson. Unless we experience a truth and carry it out, it is difficult to really teach someone else. God is surely using you and your talents to fill a niche that is so needed today. It is difficult to find good spiritual lessons that are so complete as you have done. I do Children’s Church and a lot of children’s ministry and I really appreciate your ministry. This is also wonderful for Bible Camps as well as VBS etc. May God bless you as you share your talents for Him in this wonderful way. I Love this theme. I am looking forward to working with it during vbs this year. Thanks a million. Hello Tara, this to let you know that the materials i downloaded from this site is really helpful in our Boot Camp for the youth ministry of our church. I pray that our God my return all the favor you deserve on sharing these materials free, as how Jesus gave His life and allowed us to received His Grace Free of any charge. Thanks so much for writing such a wholesome VBS program,i used both programs for the last two years which was wonderful,I actually had children given their lives to God at the end of the week.I just saw that you have written the beatitude in a lesson form,I am wondering if you can makethat in VBS form,I am sure people will buy,even though you were so gracious to make the other two free online.may God bless you. Hi, We write to you from Deliverance Church Kimulwo in Kenya, East Africa. We just finished our 5-day VBS for 81 Children using Bible Boot Camp material. We are very grateful for your availing them for use. You have enriched our Children’s progrw. May God richly bless you . Thank you for your ministry, I have not only uses the VBS programs, Armour of God and Big Heart Farms, which were great hits at my church, I have also used some of your other programs for my Childrens programs. This is a great mininstry for those of us who work with children, I look forward to your emails. I’m not sure where to leave a comment for a chance to win the free VBS materials, so this is where I choose to leave it. The materials look to be varied, covering all or most of the learning styles. I have been teaching summer lessons on Jesus featuring His parables or miracles every other year. I will use this VBS material to point children to Jesus. We took this VBS to Kenya and shared it with about 100 kids in a children’s home. I ordered pieces of the armor and foam darts from Amazon, and after each lesson, everyone shot darts at the partially armed warrior. Of course, on the last day, when he was clothed with the full armor of God, none of the fiery darts were able to hit him. Thank you! Tony Kummer (Editor) reviewed & updated this page on : March 27, 2019 at 5:18 pm. All our content is peer reviewed by our readers, simply leave a comment on any post suggest an update.